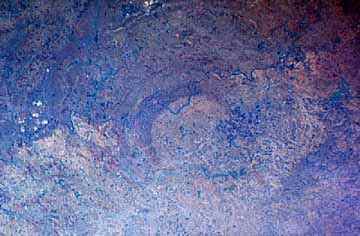 This Shuttle photograph shows a large area (80 by 120 miles) near Pretoria in the nation of South Africa. It is a rich mining area. The rocks there are also very old and the countryside is very eroded. Do you see anything that looks like a crater? Image courtesy of NASA/Johnson Space Center. Space Shuttle photograph STS008-35-1294.